2016 Leaf Pelé Immortal Collection preserves the legacy of the greatest soccer player of all-time. Each box promises one autograph and four base cards. There are only a handful of athletes who are widely regarded by others outside of their respective sports, and Pelé is among them. Headlining his many accomplishments, the Brazilian is the only player in history to have won three World Cups. He also holds several impressive records, including the most career goals with 1,283 in just 1,363 games. "The Black Pearl" is the Brazil National Team's all-time leading scorer with 77 goals in 91 games. Although he retired in 1977, there is no doubt Pelé has influenced many of today's soccer icons. Some even lend a hand in 2016 Leaf Pele Immortal Collection and help celebrate the "The Beautiful Game." 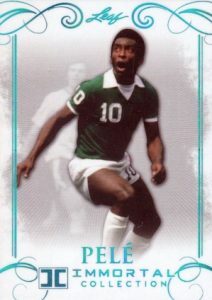 The 20-card base set offers limited print runs, including parallel cards, highlighting some of Pelé's memorable moments. Each base card has less than 100 total copies. 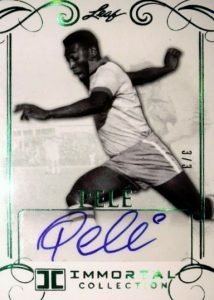 Getting to the premium options, 2016 Leaf Pelé Immortal Collection includes 20 base Autographs numbered to five or less. Additionally, the Dual-Signed Autographs combine Pelé signatures with Cristiano Ronaldo, Lionel Messi, or Neymar while Triple-Signed Autographs feature Pelé along with two other renowned soccer players. The Quad-Signed Autographs offer the final multi-player signatures that include a Pelé, Ronaldo, Neymar and Messi card. Lastly, with four different cards numbered to 20 or less, Pelé Autographed Game Worn Jersey cards give collectors an opportunity to own a piece of the footballer's storied history with both a relic and signature. 2016 Leaf Pelé Immortal Collection is an extremely limited product and the total run is only 90 cases (450 boxes). PARALLEL CARDS: Red Spectrum #/20, Gold Spectrum 1/1, Printing Plates 1/1. PARALLEL CARDS: Red Spectrum #/3, Gold Spectrum 1/1, Printing Plates 1/1. PARALLEL CARDS: Red Spectrum #/2 (*Card #03 - #/5), Gold Spectrum 1/1, Printing Plates 1/1. PARALLEL CARDS: Red Spectrum #/5, Gold Spectrum 1/1, Printing Plates 1/1.